Often, the best treatment for obstructive sleep apnea is continuous positive airway pressure (CPAP.). It’s the only effective treatment for severe sleep apnea. Continuous positive airway pressure (CPAP) is the best treatment for obstructive sleep apnea. 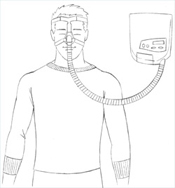 With CPAP treatment, you wear a special mask attached to a CPAP machine (also called a flow generator). The CPAP machine blows a steady stream of air through the mask, into your nose and down your throat (airway). The stream of air creates pressure, which holds the tissue in your airway open. This stops your airways from collapsing. Your airway stays open all night, so you can breathe properly all night. The soft, steady jet of air from the CPAP machine creates enough pressure to keep this man’s airway from collapsing. A man wearing a CPAP mask to treat his sleep apnea. The CPAP mask delivers a soft, steady steam of air to keep the man’s airway open. To get CPAP treatment, you need a prescription from your doctor. Medical suppliers can’t sell you CPAP equipment unless you have a prescription. CPAP is the first and the most effective treatment choice for substantial obstructive sleep apnea. There are other treatments; your doctor may prescribe these if you have mild or moderate sleep apnea. Lose weight. Overweight people can have extra tissue around their necks- this tissue can block their airway. By losing weight, you can shrink the tissue around your airway, and allow more air to pass to your lungs. Studies show that people who lose 10% of their weight can have a 30% decrease in their sleep apnea symptoms 1 . Avoid alcohol and sedatives (medicines that make you sleepy). Alcohol and sedatives can make your throat muscles relax too much, allowing your airway to close off. If you avoid alcohol and sedatives, you may be able to keep your airway open. Read more about avoiding alcohol to improve sleep apnea symptoms. putting pillows against your back to prop yourself on your side. using the “tennis ball trick”: sew a pocket onto the back of your pajama top and put a tennis ball in it. If you start to roll to your back during sleep, the pressure from the ball will make you roll back onto to your side. Lifestyle changes don’t work for everyone, and may not work forever. As you get older or if you gain weight, these simple solutions may no longer treat your sleep apnea symptoms. Keep track of your sleep apnea symptoms. If your symptoms come back, see your doctor for another kind of treatment. If you have mild or moderate sleep apnea, your doctor may suggest you use a dental appliance (also called an oral appliance). The dental appliance fits over your teeth. You wear it at night. It holds your tongue and jaw towards the front of your mouth, so they don’t slip back and block your airway. Fixed dental appliances fit over your teeth. They can’t be adjusted. Adjustable dental appliances also fit over your teeth, but they can be adjusted. The dentist can adjust them forward or back, so the appliance has a fit that’s suited to your mouth size and shape. Adjustable dental appliances are better that fixed ones. To get fitted for a dental appliance, you should see a dentist that has experience in fitting these devices. There are over 80 models of dental appliance on the market. Your dentist should work with your sleep specialist doctor to choose the model that’s right for you. Some people have jaw pain and temporary chewing problems as they get used to wearing a dental appliance. If your dental appliance isn’t comfortable, talk to your dentist. It’s important that you have an appliance that’s comfortable enough to wear every night. Once you’ve started using a dental appliance, your doctor may send you for a follow-up sleep study polysomnography or home monitoring. This will show whether the dental appliance gets rid of your obstructive sleep apnea symptoms. If you can’t use CPAP therapy, your doctor may suggest surgery to treat your obstructive sleep apnea symptoms. Surgery for sleep apnea is not ‘one size fits all’. For surgery to help, the doctor needs to know exactly what part of your airway is getting blocked. An ear, nose and throat specialist (otolaryngologist) can examine your nose, mouth and throat to pinpoint the problem. Please keep in mind that surgery can be risky. Most surgery isn’t reversible- once it’s done, it’s done. In some cases, surgery may actually worsen a person’s obstructive sleep apnea symptoms. This is why doctors don’t recommend surgery in most cases. If you have sleep apnea because your tonsils are too big, you can have surgery to remove them. Like any kind of surgery, tonsil surgery can lead to complications (problems). Tonsil removal is the most common treatment for obstructive sleep apnea in children. In this procedure, which doctors call “U triple P”, the surgeon cuts away the uvula and part of the soft tissue at the back of the throat. UPPP may reduce snoring and sleep apnea events (pauses in breathing). Like any kind of surgery, UPPP surgery can lead to complications (problems). Some people who’ve had UPPP surgery have nasal regurgitation (fluids going up your nose when you swallow). If your sleep apnea is not controlled, you may have trouble using CPAP after this surgery. You may hear of new sleep apnea treatments on the web or in newspapers. They may have benefits if you have mild or possibly moderate sleep apnea. For people with severe sleep apnea, CPAP is still the only treatment option. If you are thinking about trying a new treatment for sleep apnea, talk with your sleep specialist. Your sleep specialist can tell you the risks and benefits of any new treatment, and can explain whether it would be helpful in your particular case. Sleep apnea is not just an annoying habit; it is a serious condition. It could even kill you. If you do nothing about your sleep apnea, you put yourself at higher risk for diseases, accidents, and early death. You can develop high blood pressure. Your risk of heart attack or stroke increases. Your memory and concentration can worsen. You are at much higher risk of causing a car accident (motor vehicle crash). You may develop an irregular heart beat. 1. Peppard PE, T. Young, M. Palta, J. Dempsey, and J, Skatrud. Longitudinal study of moderate weight change and sleep-disordered breathing. JAMA 2000; 284:3015-3021.